Lying on the western coast of the Nicoya Peninsula, Tamarindo is located in north-west Costa Rica, just over four hours’ car drive from the island’s capital city, San José. For those of you who prefer things on a smaller and more characterful scale, with a population of just over 6,000 people in Tamarindo and the surrounding Santa Cruz district, the town offers a greater sense of freedom. That doesn’t mean there is nothing going on though as there is a buzzing nightlife and more than enough shops and restaurants to keep everyone happy. For those of you who are more into exploring rather than lazing on a beach, or if you prefer your holiday to have the word ‘activity’ in front of it, Tamarindo, Costa Rica definitely won’t disappoint. Tamarindo is one of those magical places that has the capability of catering for all tastes and budgets. From small and intimate hotels or guest houses, though boutique hotels, to five-star luxury, the choice is outstanding. More to the point, bearing in mind the town’s location, so many of these hotels also offer memorable sea views that will leave you in little doubt that you have found the perfect vacation escape. Click here for further details of these and other hotels in Tamarindo, Costa Rica. It can be difficult to decide, from a distance, which hotel will best meet your requirements, which is why, at Costa Rica Rios, we are here to help you. We want your holiday to be stress-free from the moment you book it, not just when you arrive, so get in touch and let us help you create the perfect holiday in one of many, many stunning locations in Costa Rica. With Costa Rica being closely associated with the Caribbean, local food in Tamarindo, Costa Rica has a distinct style, with an abundance of fresh fruit and vegetables, not to mention spices, along with rice and beans. With lengthy coastlines, fish and seafood also plays an important role in Costa Rican cuisine. You’ll find food stalls everywhere, cafes and small local restaurants which will enable you to embrace local food culture, and if the thought of a spicy coconut soup appeals, ask for the local dish ‘rondon’. Cuisine from across the globe can be found in the eclectic mix of more formal restaurants, including Asian, Italian, and French. You have to try the delights of the beachfront fish shack, Nogui’s, on Playa Tamarindo, or if you are partial to something more Mexican style, then try Green Papaya for fantastic burritos. With an abundance water-sports activities, it’s all too easy to work up quite an appetite, so what better way to get your day off to a start than visiting La Bodega and discover just how many different meals you can create from eggs. Of course, embracing the local atmosphere will be a ‘must’ for many of you, so El Casado del Carro should be on the top of your list of places to eat in Tamarindo, Costa Rica, with the best of the best in casados, served from the back of a red Toyota Hatchback last time we checked! Details of further restaurants in Tamarindo, Costa Rica can be found here. 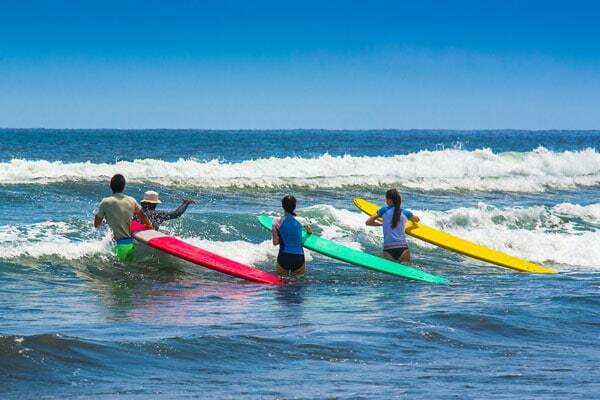 Located alongside the Pacific Ocean, it should come as not surprise to discover that Tamarindo, Costa Rica, and surrounds has some of the best beaches in Costa Rica, which in turn provide you with a whole raft of water sports activities (excuse the pun). Enjoy picture-perfect, long, sandy shorelines to walk along, especially at sunset. Langosta Beach (Playa Longasto) is one we shouldn’t write about, because its beauty lies in the fact it is seldom busy. If tranquility is what you are seeking, head for Langosta Beach, relax and enjoy the sound of waves gently lapping at your feet. Tamarindo Beach (Playa Tamarindo) attracts because of its location and connection to the town. Here you can enjoy food and drinks at beachside shacks, or take a detour along the beach while exploring the rest of the town. This beach is more a social gathering place than for lazing in the sun. For surfing in Tamarindo, Costa Rica you won’t find much better than Avellanas Beach (Playa Avellanas), while for those who prefer to watch surfing rather than take part, why not enjoy a local Costa Rican beer here, in the shade of a palm tree, while enjoying some delicious local food. For a more details on beaches in Costa Rica, check out our comprehensive guide here. If you want to ask any questions about any of the activities we have listed, or if you want to know if any other specific activities are available, please don’t hesitate to ask. At Costa Rica Rios, we are here to help you in any way we can. With its tropical climate and balmy evenings, so much of Tamarindo’s nightlife can be enjoyed in the open air. El Vaquero Brewpub is located on the beachfront and has its own microbrewery, while there are restaurants galore to choose from. There are more bars than you can shake a stick at, some with big-screen TVs if you need a sports fix, while many also host poker nights. There is a casino in town for those of you who may want to see if Lady Luck joined you on your holiday, while Aqua Disco is the place to go to capture more of the party scene.